The Lewisville Area Chamber of Commerce celebrates Primrose School of Old Orchard’s 20th anniversary (photo courtesy of Primrose Schools). Primrose School of Old Orchard is celebrating 20 years of early childhood education in the Lewisville/Flower Mound community. To commemorate the 20-year anniversary, Primrose School of Old Orchard created a rock garden in front of the school, according to a news release. Each student and teacher painted a river rock to include in the outdoor space. Students choose special words related to education and character to adorn their rocks. 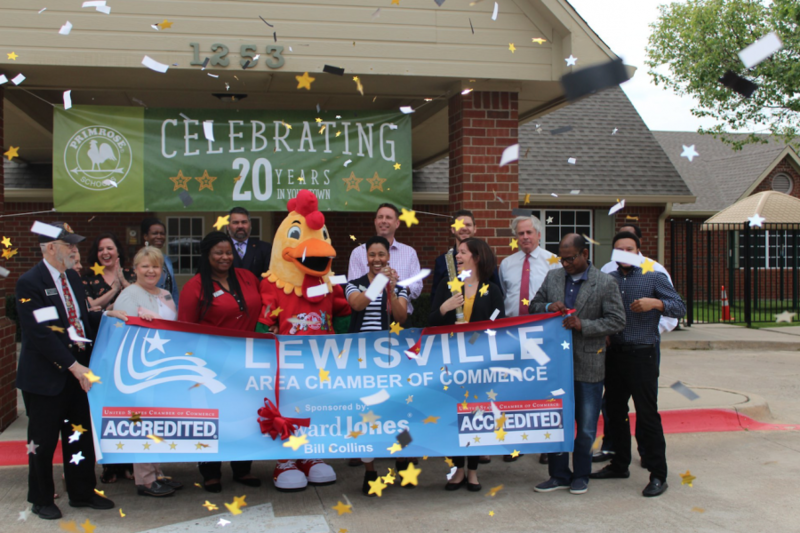 On Thursday, the school welcomed the Lewisville Chamber of Commerce for a 20th anniversary ribbon cutting. Students enjoyed an outdoor celebration including music, dancing, cupcakes and a special visit form their school mascot, Percy the Proud Rooster.